Probably my favorite topic to write about is....writing. I confess I am fascinated with the writing process, and I have found over the last few years that my spirituality has became intertwined with my writing disciplines. In this past week a couple of my articles on writing have been re-posted on different sites, so I want to share those with you today. If you've already read them, then that's one less thing you need to do before the three-day weekend. If you haven't, now is your chance. I'd love to hear more about you and your process of creating. To read the whole posts, click on the links at the top of the snippets. I spend a lot of time reading what other writers say about writing. It’s an excellent way to procrastinate from actually writing. In reading the words of seasoned authors, who themselves are usually writing about writing in order to avoid other projects, I have discovered two recurring themes. The process of writing may very well make you crazy. And it may also make you a mystic. I once heard a writer say that her writing process involves letting her ideas drip down from her mind through her arms and into her fingers. What a beautiful image, I thought to myself, and what a total load of crap. Writing a book is like giving birth to a snarling 8 headed monster. It’s a war, and your mind, arms, and fingers all hate each other. When you grow up as a Gen-Xer, cynicism is a badge of honor. It is part of your identity, and it is how you belong. Cynicism was the key that unlocked friendship with your peers, and you bonded with others based on your mutual disdain, disappointment, and hurt. And we Gen-Xers had plenty of good reasons to be cynical. We saw plenty of bad marriages, corrupt leadership, dysfunctional churches, and absentee authority figures. A strange thing happened along the way of my 30s. I started losing my cynicism. And I think a lot of my peers have too. My first question, in relationships, in church, and in life is no longer "What is wrong with this?" I no longer think that my generation, or any generation, knows better than everyone else. I have started asking new questions like "What can I learn from this?" and "how is God at work in this situation or person that I don't fully understand?" You realize that you are the church, not only someone who is influenced by the church. It is in those stages that you are required to construct something, not just critique everything. You become responsible for the well being of people other than yourself, and no spouse, parent, or leader wants cynicism for someone else. No one wants to raise a cynical child. No one wants their husband or wife to become more suspicious the longer they are married. No leader wants a group of followers with scowls on their faces. And no one wants a church built on a foundation of skepticism. The shift from cynicism to hope can be abrupt. When I became a pastor it was quite a shock to realize that I had become the object of cynicism rather than one of its many subjects. When my wife and I got married we realized that our skepticism about relationships could absolutely not extend to our marriage if we wanted to survive. When my good friends went from a large church they attended sporadically to a small community that required their participation and leadership, they were disoriented, even lost. But in time they came to create something beautiful, a community that became a harbor for recovering cynics. Don't get me wrong: I still asking probing questions and have a healthy suspicion toward some institutions and people. But most of my new questions are designed to draw me in to a greater understanding and intimacy, not to protect me from those things, as my old questions did. In the end, cynicism is exhausting and poisonous and profoundly lonely. I am tired of holding the world at arms length. I don't want out anymore. I want in. Last week I shared that I am in the midst of transition, and perhaps nothing carries anxiety with it like transition. The uncertainty, the loss of control, and the ambiguity all mix up a potent anxiety cocktail, and I'm not drinking it in sips. This seems like the perfect opportunity to introduce to you my friend Rhett Smith's new book The Anxious Christian. In fact, we're going to make history today with the first ever Introverted Church book giveaway. Remember this day, for you will speak of it often, or at least until I shut this blog down. All you have to do is leave a comment between now and Monday at noon pacific and Rhett will pick two winners on Monday afternoon. Rhett's personal story is profoundly honest - vulnerable, agonizing, and joyful. He does not settle for the quick fixes of pop psychology or the veneer of superficial Christianity. In reading The Anxious Christian you will find yourself plunged into the heart of anxiety, and in the deep waters of God's healing grace. That's just good writing. Jon Acuff also wrote the foreword, but mine is better. Rhett's book is different in two ways: 1. He includes much of his personal story about anxiety, and believe me, there are some heart wrenching moments in there. It reads more like a novel than a psychology textbook or self-help book. 2. He treats anxiety not simply as a problem to be brushed aside but as something that God uses to change us. I get frustrated with pastors and authors who tell us to ignore our feelings and inner stirrings and to get about the business of faithfulness. In contrast, Rhett takes our feelings seriously and invites us to offer them to God rather than pretending that they're not there. So if you've ever wrestled with anxiety (*cough*everyone!) then this is the book for you. Boring but necessary logistical discussion: Since this is my first ever book giveaway, I'm a little sketchy on the details. Here is the best I have come up with: Leave a comment about why you want to read this book and then check back on Monday evening. Rhett is going to directly reply to the commentors who win and include his email address, and then the winners will send him their mailing addresses. This post comes to you from Chelsey Doring. Chelsey posted a version of this on her blog last week and I asked if I could re-post it. It nicely and humorously captures some of the first issues that introverts have with church culture, especially in an evangelical culture that emphasizes sharing and transparency. And has anyone considered what that is like for people who have never stepped foot in that church, or any church at all? I’ve been in church my entire life, and this entire process ties knots in my stomach. I understand the rationale behind it (we want to be a friendly, welcoming community), but isn’t this accomplished in a less forced manner before and after the service, over donuts and coffee? Awkward encounters are so much easier with caffeine and sugar. It is for this reason that I really love running slides or doing some other manner of work for the church during the beginning of the service. Can’t shake your sweaty hand if mine are busy doing something else. Okay, look. I will tell you what I think once I want to say it. Trust me, I am very opinionated. Just because I am sitting quietly in this group of people, listening to all of them talk about their lives or this Bible passage or this idea, doesn’t mean I have a rock for a brain or that I’m too scared to speak up. Or, even worse: that something is wrong with me. The worst offenders for this one are small group leaders and youth directors. And I know that for a fact, because I am one. Take it from me: if an introvert isn’t speaking, it isn’t because nothing is going on upstairs. It’s because they’re thinking. And once they feel comfortable enough, they will share. And yeah, that might take a couple minutes. A couple weeks. Maybe even a couple months. Their silence isn’t a reflection on your leadership! Leaders like me need to be secure enough in ourselves so that we can let the silence happen. It's not "awkward" until you make it awkward. At this point, you may be wondering if I actually like people. I like people. I really do. At the church where I work, we meet weekly to pray over the prayer requests we receive as a staff. We separate into groups of 3 to 5, go to separate corners of the church, and begin to pray over the list. I have a mini-panic attack every single time. I hope I’m adept enough to cover it. I’m probably not. Recently, one of the pastors at my church gave a devotion about how people pray out loud. He said that if a person asks for things that God has already promised, like his presence or his faithfulness, then it’s foolish and they probably have a pretty weak faith. Right. As if I wasn’t already self-conscious enough. I'm convinced that "go with the flow" is a distinctly extroverted phrase. Also, I’m not sure I’ll ever be able to use the phrase “go with the flow” again. I once had a very influential camp counselor tell me that. My sister and I are very close now, and I would love to be more like her, because she is clearly cooler than I am. When we were in high school, my sister was a beautiful, blonde, popular, fashionable, outgoing cheerleader. I was a somber, dark-haired band nerd who wore jeans and t-shirts and hated high school. Of COURSE I wanted to be more like her! Who wouldn’t?! God has created us all so beautifully and uniquely. There is no reason to apologize for that. I am very sure that other introverts out there have had similar experiences. Please feel free to share, because I know that I shouldn’t be so presumptuous as to speak for all introverts everywhere. But only if you feel comfortable enough. 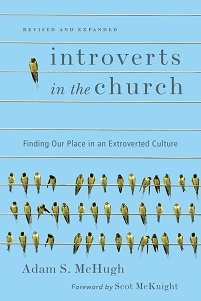 If you want to read more about introverts and church, check out Adam's book Introverts in the Church. A couple of nights ago I couldn't fall asleep. I was on call and my beeper sat on my nightstand 8 inches from my head, scowling at me, threatening to make a nefarious digital laugh at any second. One of these days I'm going to summon all my strength and throw it back to 1992 where it belongs. I have a lot on my mind these days and it's causing me more anxiety than I am accustomed to. I used to take pride in the fact that I was unflappable, but I am in a season of life in which I am flapping quite a bit. I believe I have landed in one of those "liminal" places - the transitional time, suspended between two places, unwilling to go back but unable to reach the other side. It's the place where your stomach never feels quite right, like you're either in a perpetual state of mild nausea or you're in a non-stop free fall. So I lay there, staring at the ceiling in the dark, listening to my wife breathe softly and the cat by my side purr quietly, and I thought about sleep a lot, which really isn't as restful as actually sleeping. Willing yourself to sleep, as you probably all know, is completely ineffective. Shutting your eyes tighter, actively trying to sweep all the thoughts and images out of your head, and searching for the perfect sleeping position only brings joy to the god of wakefulness. The only thing that helps me drift into sleep on those nights is to pay a light attention to my breathing. I don't focus hard on the rhythms of inhaling and exhaling, but I allow the breath cadence to fill my mind and body until there is nothing else. If a thought or memory or image comes to mind, I just allow it to float through and out of my mental sight-lines like a cloud through the sky overhead. I am emptying my mind so that I may experience rest. It occurs to me, two mornings later, that falling asleep is a perfect image for contemplative prayer. In contemplative prayer we seek to rest in the Lord, to sit in silence with him and simply enjoy him. To that end we empty our minds for a time- allowing active thoughts, words and images to float through without concentrating on them. Yet the goal of contemplative prayer is not emptiness but fullness. True rest is not the mere absence of activity. We aim to fill our minds, souls, and hearts with the peace and presence of God in Christ, interwoven with the life of the Spirit in us. We are reminded that in order to be truly "filled by the Spirit" we must release the distractions that keep us listening only to the sound of our own minds. 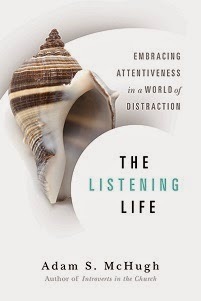 Our prayer technique may involve an "anchor" - like the rhythms of breathing or a short phrase like "Come Lord Jesus" - to help us move past those distractions and to become attentive to the sounds of the Spirit reverberating through us. Contemplative prayer is not in competition with other forms of prayer and it certainly is not in conflict with word-based devotions and practices. I do wonder though if contemplative prayer is the prayer of the liminal place, because transition surfaces so much anxiety in us. There is so much ambiguity and mystery in transitional seasons. If we concentrate all our energy on the anxiety that inevitably comes from ambiguity, and attempt to problem-solve that loss of control, we only give it a louder voice. Maybe what we need is to, in faith and hope, fall asleep in the Lord. If you think about it, sleep itself is a liminal state. The old day has passed, but the new day has not yet begun, and we rest in the trust that the Lord is still working and that the sun will rise.